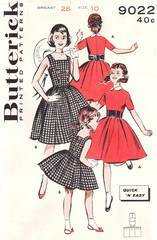 Quick and Easy vintage Butterick pattern for girls' dress in two versions. Double breasted effect sundress version has square front and back necklines. Short sleeved version has Peter Pan collar and wide contrast belt. Girls' Size 10; Breast 28 Waist 24; Hip 30. Pattern is complete and neatly cut and folded. Two minor modifications to the bodice sections - they have been cut on the "shorten here" line - the cut off strips are present and can easily be added back on. All other pieces are in excellent condition. Envelope is in excellent condition.